Image: Cover art to The Immortal Iron Fist #6 by David Aja. In less than a month, martial arts superhero Danny Rand is heading to Netflix for his own TV show—and he’s being heralded as “the fourth Defender” as much as he is by his actual hero name, the immortal Iron Fist. He’s had a long history in Marvel Comics, both on his own and as a partner in crime-fighting. So here’s what you need to know about Iron Fist before his show premieres on March 17. Danny’s first appearance on the cover of Marvel Premiere #15. Art by Gil Kane. By the mid-‘70s, the Wuxia style of martial arts movie—movies that featured fantastical elements and action based around swordplay rather than direct hand-to-hand combat—was facing a backlash at the hands of a more grounded, realistic approach to martial arts. The kung fu movie was riding a sea of popularity once more as films like Fists of Fury and Enter the Dragon dazzled American audiences, and Marvel itself was happy to ride that wave to help create new comic book heroes. Two characters stood out the most from Marvel’s efforts: Shang-Chi, who debuted in 1973, and Iron Fist, who first appeared a year later in Marvel Premiere #15 in a story from Roy Thomas and Gil Kane, inspired by a mix of Thomas’ first experience watching a kung fu film and elements from the ‘40s Bill Everett superhero comic, Amazing-Man. 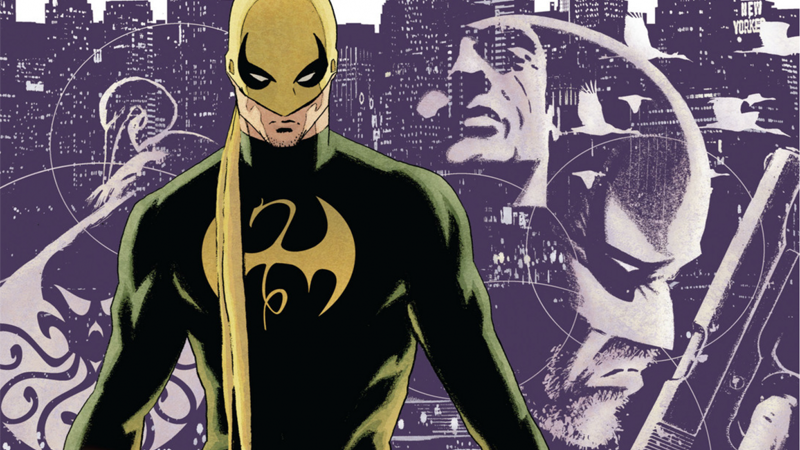 Their story, “Fury of Iron Fist!”, saw an adult Danny Rand reflect on how he first came to train in K’un-Lun, a mystical city of legendary masters of the martial arts and chi-channelling that only physically appeared once every 10 years. The son of millionaire Wendell Rand—who actually grew up himself in K’un-Lun after being adopted by its ruler, Tuan, and had himself trained there in an attempt to harness the power of the Iron Fist—Danny first came across the city after facing immense tragedy. In an attempt to return to K’un Lun, Wendell staged an expedition the city’s predicted location with his wife, son, and business partner Harold Meachum. After an accident left Wendell dangling from a cliff face, Meachum callously let his partner fall to his death in an attempt to claim the entirety of their business together for himself, while Danny and his mother Heather looked on in horror. Shortly after, Danny’s mother sacrificed her life so the young child could flee a pack of wolves chasing the pair—leaving the child alone by the time K’un-Lun appeared, where Danny would go on to be trained, and hone his desire for vengeance against Meachum under the tutelage of Lei Kung, the Thunderer. After telling his initial origins Thomas and Kane passed off Danny Rand to other creators as the character surged in popularity, and after a 10-issue stint in Marvel Premiere, Danny got his own self-titled comic book in 1975 from Chris Claremont and John Byrne. The cover to Power Man #50, the first formally retitled as Power Man and Iron Fist. Art by Dave Cockrum. Just 15 issues after Claremont and Byrne’s solo Iron Fist series began, it was already facing cancellation. In an attempt to save the character from disappearing altogether, a decision was made to pair Danny up with another superhero that was threatened with a similar fate: Power Man, better known these days as Luke Cage. Danny’s debut adventures with Luke began in 1978’s Power Man #48, and by the end of their first team-up three issues later, the comic’s name was formally changed to Power Man and Iron Fist. Danny and Luke’s partnership as mercenary “Heroes for Hire” is one of the most iconic in Marvel history, and their series ran until 1986. It even ended with Danny dying. When he “got better” half a decade later in the pages of Namor the Sub-Mariner, it was revealed that the Iron Fist killed in Power Man and Iron Fist had simply been a doppelganger, but Danny’s status as an ephemeral team-up partner lived on, following his appearances before his “death” in the ‘80s in famous team-up books like Marvel Two-in-One or Marvel Team-Up. As well as his own solo miniseries from the likes of James Felder and Robert Brown, and Dan Jurgens and Jackson Guice, throughout the ‘90s Danny flitted in between appearances in Heroes for Hire and crossover series like Iron Fist/Wolverine. Although it’s never been explicitly laid out in a list, the power Danny wields as the Iron Fist is not one that is his alone—it’s a power earned in K’un-Lun by defeating the mystical dragon Shou-Lao, whose heart (separated from the Immortal creature) grants immense power, as well as the title of Iron Fist to those who kill it in battle. Danny did so at the age of 19 through a mix of his decade of dedicated training under Lei Kung and some quick thinking: guessing that Shou-Lao got its power by directly drawing on his heart’s energies through a dragon-shaped mark on its chest, Danny leaped onto Shou-Lao, essentially bear-hugging the dragon to death and searing its mark onto his own chest. The Immortal Iron Fist series mentioned earlier really delves into the cyclic nature of the Iron Fist in K’un-Lun. It mentions several previous K’un-Lun natives who held the title before Danny—and implies that, as Shou-Lao has reincarnated 66 times, that Danny himself is the 66th Iron Fist—and even directly introduced us to Danny’s direct predecessor, Orson Randall, a much rougher, gun-toting incarnation of the Iron Fist thought long dead by the time Danny was training in K’un-Lun. We’ve even met potential future Iron Fists after Danny in the comics. Wah Sing-Rand, a direct descendant of Danny and the Iron Fist of 3099, makes a brief appearance in Immortal Iron Fist #21, and last year, Marvel began teasing an as-yet-formally-unannounced series from Kaare Andrews and Afu Chan called Iron Fists, art from which featured Danny fighting alongside a young girl who wields the same power Danny does. So What *Is* an Iron Fist, Exactly? Iron Fist thwacks Colossus about in Iron Fist #15. Art by John Byrne, Dan Green, and Bruce Patterson. After plunging his hands into the molten energies of Shou-Lao, what did the powers of the Iron Fist actually give Danny? Well, aside from enhancing his already rigorous martial arts training, the primary focus of Iron Fist’s powers surround the art of chi manipulation. Danny can channel his internal life forces to give him heightened senses, agility, strength, and durability, and even use it to heal his own injuries or externally project it to heal someone else (in some cases, the external project can be used offensively, too). In extreme circumstances, Danny can even use his chi as a psychic power, letting him sense his surroundings or meld with someone else’s consciousness. Mainly, though, it can also be used to punch people really hard. Danny earned the nickname “The Living Weapon” for a reason: by channeling all of his chi into a single, glowing fist, he can deliver deadly blows of superhuman power and hardiness that can level almost anything in its way. The nature of the ability—the literal “Iron Fist”—also means using it goes without causing any harm to himself, beyond exhaustion from over-exerting his chi manipulation, although that’s become less of a factor over the years. Pretty much all you need to know is that when he wants to, Danny can hit you real hard. But even when he’s not using the Iron Fist, he can still rough you up pretty bad thanks to his years of intense training.